If you need to simply make a prototype of an IoT solution that combines hardware and software, then you have landed on the right place. This post is about combining the benefits of using both littlebits and scriptr.io to build your own IoT application, through this easy step by step tutorial. In this tutorial, we will implement a simple scriptr.io application that remotely turns on and off a led light that is part of a simple littlebits circuit. Download the complete source code. 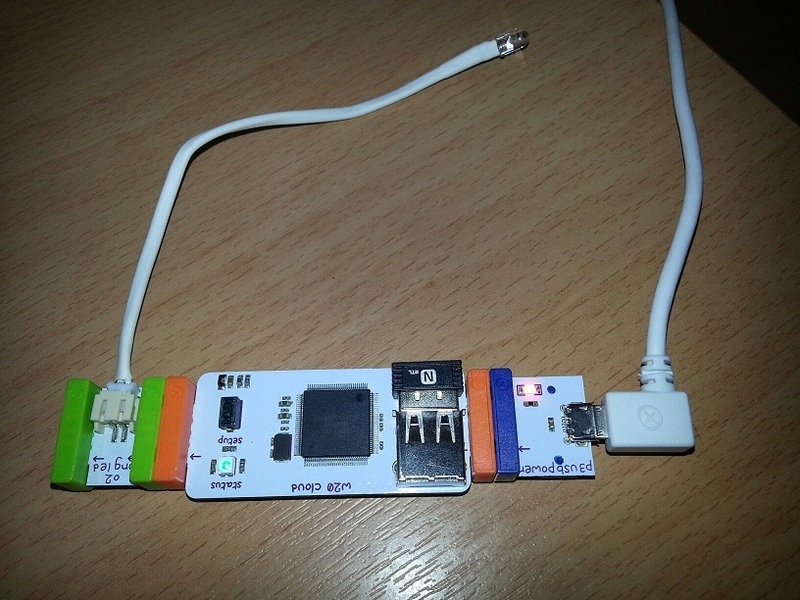 Our application has a hardware side – the electronic circuit made of littlebits components – and a software side. On the hardware side, we setup a simple circuit composed of a USB power adapter, a cloud module and a led light. The controller module, implemented using scriptr.io’s scripts and notably, our littlebit connector. In the coming paragraphs, we only focus on the implementation of the software components. We assume that all scriptr.io scripts will be created in the following folder stucture: “sample/littlebits”. 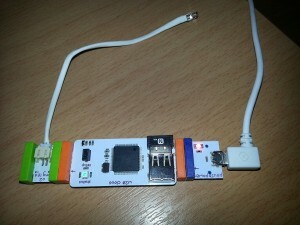 Our controller module’s job is to convey instructions (on/off) from the UI to the littlebits circuit, using the littlebits connector and reciprocally, inform the UI of the status of the led light. We concentrate this logic into a script that we call lightManager. We will expose its “toggle light” and “get status” features through two other simple scripts, used as public APIs: toggle and light, described further. 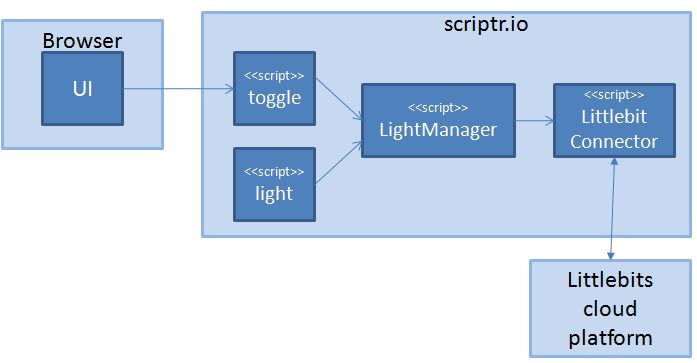 As mentioned, the lightManager script implements two main features: (1) turn on and off the led light and (2), inform the UI about the light’s status. In order to do so, our script needs to generate output to the littlebits circuit, respectively subscribe to events stemming from the latter in order to detect the change of status. Let us first implement the toggle function that generates output to the circuit. What we need to start with, is to require the cloudbits script of our connector and create an instance of the Cloudbits class that it contains. This is the main gate to communicating with littelbits’ APIs. // note that the userid should be the one of your littlebits account. "errorDetail": "deviceId not found in request parameters"
So far, we can turn the led of our circuit on and off. However, our lightManager script cannot assume that this resulted in changing the light’s status (of course we can see it but the script needs confirmation). One way for the script to know that something has changed is to subscribe to some event, for example, voltage jump. In order to subscribe, we need to provide a callback that will be invoked by the littlebits cloud platform once the event occurs. 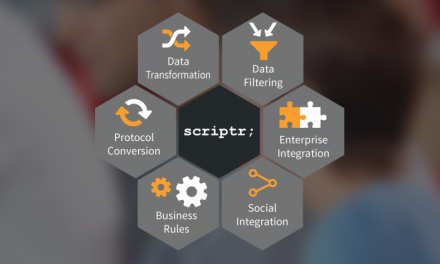 // replace YOUR_SCRIPTR_AUTH_TOKEN with your actual scriptr.io authentication token. Great. So far in our implementation, we can send a request to the toggle script, passing it the “deviceId” parameter. This script will invoke the toggle() function of the lightManager script, which will instruct to generate output (100 or 0) in our circuit, then subscribe the handler script to voltage jump events stemming for the latter. Let us now see how to handle these events. Our controller module is now complete. We implement a generic function that will be used at different places of the UI, to issue AJAX requests towards our scripts (“toggle” and “light”). The function can handle the creation of GET and POST requests. // we insert this call into an "interval"
The below function hides and displays the corresponding light bulb images depending on the status that is received in the response of the asynchronous request that is sent to our “light” API. This function is passed as a callback to the latter.